Over the past few years, I've been working with high volume real-time message based applications. As we scale these systems out, resource usage becomes increasingly important and various trade-offs have to be considered. Luckily, we are working with Apache Camel and its implementation of EIPs (Enterprise Integration Patterns) make solving these types of issues fairly straight forward. In particular, the split and aggregator patterns are designed for just this type of message flow. For example, let's say I have 3 systems that process messages...A, B, C. System A produces messages and sends them to system B. system B does some processing and then sends them to system C for final processing. A few months back I had the opportunity to present at ApacheCon in Denver, CO. While the conference was small, I had the chance to meet some interesting people in the community and learn about some other Apache projects. My presentation was an introduction to how to use Camel to address common business problems (common to my experience anyways). If you are using Spring to access/configure resources (DAOs/services), then you might as well add some basic performance monitoring while you are at it. 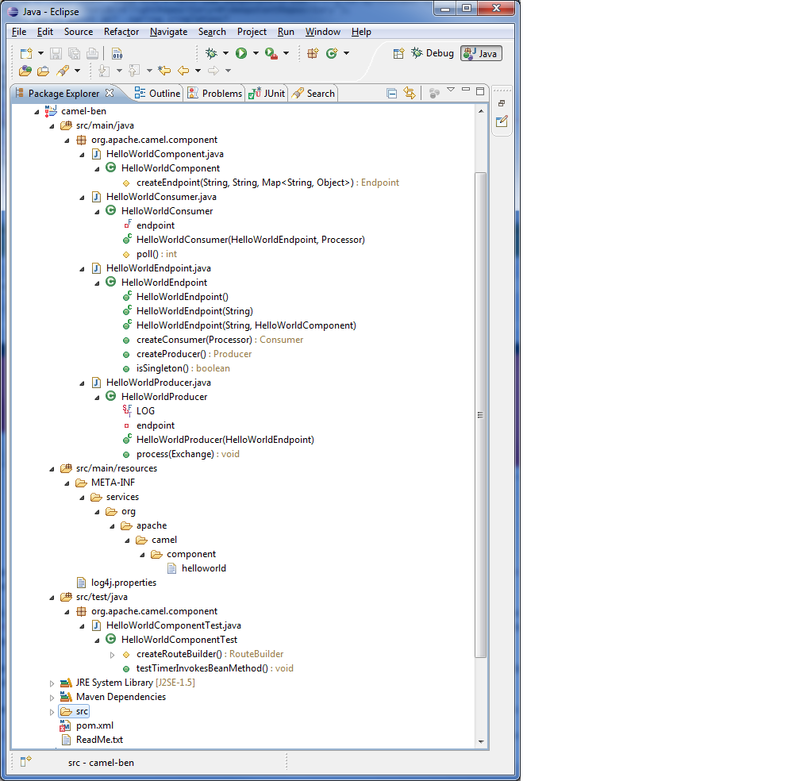 This is a trivial task with Spring AOP and doesn't require any changes to existing code, just some simple configuration. Next, identify what needs monitoring and put the AOP hooks in place. Generally, this just requires adding a pointcut and advisor configuration in your existing Spring XML configuration file. 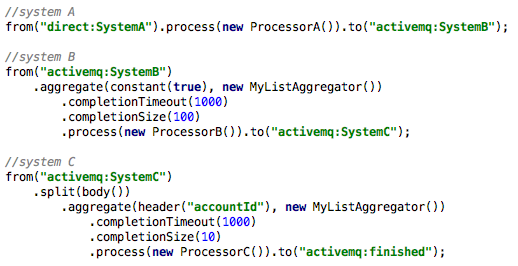 This configuration will add method response time logging to all methods in the "com.mycompany.services" package. Note: these classes must be instantiated with the Spring context...otherwise, the AOP hooks will not be executed. Next, you need to setup your logging (log4j, etc) to enable TRACE on the interceptor class. This is a some great raw data, but unfortunately is not very useful on its own. Its for every method call and doesn't provide any other stats. This quickly clutters up the log and without some way to process/aggregate the log entries, its hard to make sense out of it. So, unless you plan of writing some log parsing or using 3rd party software (like Splunk or Cati), then you really should do some processing of the data before writing it to the log file. One easy way to do this is to just write a simple interceptor class to use instead of the Spring default one (PerformanceMonitorInterceptor). Below is an example of this that provides periodic stats (last, average and greatest response time) as well as warning whenever a method response time exceeds a configured threshold. By default, it will log stats every 10 method calls and log a warning message anytime a method response time exceeds 1000ms. Here is a simple unit test (extends CamelTestSupport) to get a feel for how quickly Camel routes add/remove from a JMS queue. This should give you a ballpark latency estimate (~5ms for my setup). You can also get some great AMQ performance stats via JMX to monitor an active system.